Cinema in the Soviet Union was one of the most controlled mediums under the Communist regime. As a result of this, each era, marked above all by changes in the leadership, transformed the aesthetics of Soviet cinema along different visual and aural lines. Under Vladimir Lenin, the cinema that was produced was avant-garde and abstract; under Josef Stalin, the driving aesthetic was based on Socialist Realism; Nikita Khrushchev’s Thaw brought the theme of dreamscapes to the fore. In this first part of the history of Soviet aesthetics, we will look into how the basics of the cinema changed from Lenin to Khrushchev, how each leader affected the control of the cinematic output of Soviet directors, and what this meant for the aesthetics of the Soviet Cinema. Lenin is often quoted as saying that ‘film for us is the most important of the arts’. Despite there being no clear proof that Lenin ever actually said this, the actions that the Bolsheviks took to control and produce cinema as early as November of 1917 speak volumes. They almost immediately set up the People’s Commissariat for Enlightenment, and Anatoly Lunacharsky, head of the People’s Commissariat for Education, sought to involve film in the propaganda output for the revolution. This shows how strongly the Bolsheviks felt about the control of not just cinema, but art as a tool for social engagement and Agitprop (political propaganda in art and literature). The careful fostering of the early cinema, along with other artistic media, led to the explosion of the avant-garde in the aftermath of the revolution. Films in Russia became dramatically different to those being produced in the West. These films tended to have long, drawn out shots that cut together systemically and in a logical order. They were often based on short ‘incidents’ such as a man losing a boat, a woman chasing a child around, and were fairly simple narratively. 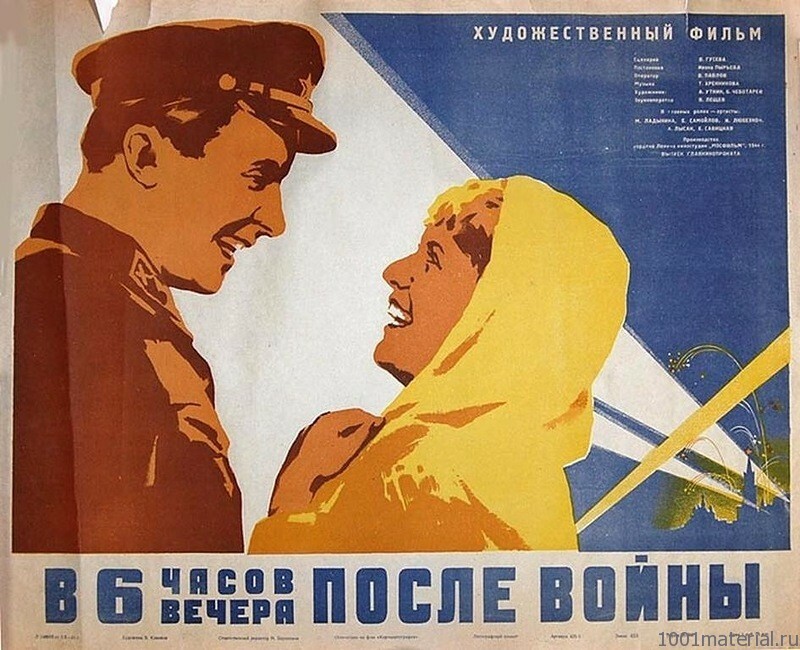 Although initially taking inspiration from the West, a technique of editing called ‘montage’ quickly became the dominant artistic style in the East, prompting many theorists and historians to call this the Golden Age of Soviet cinema. 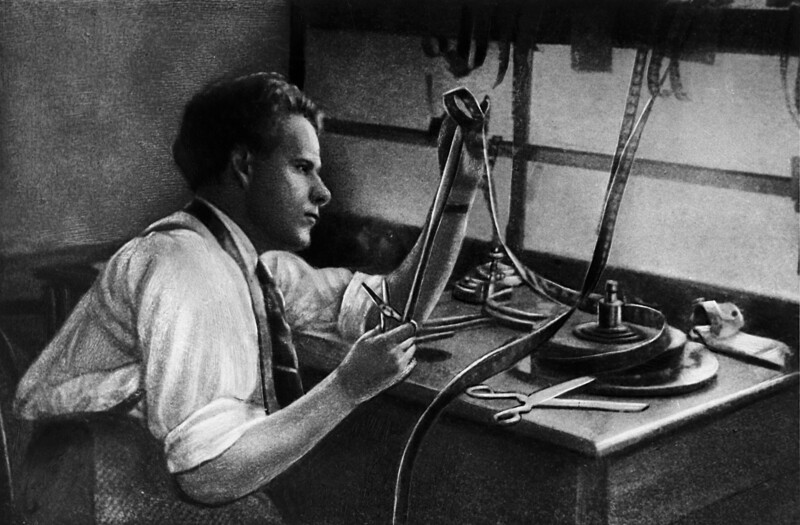 Originally devised by Lev Kuleshov, the most famous Soviet filmmaker Sergei Eisenstein would exploit the montage edit dramatically in his first feature film Strike, which follows a group of striking factory workers in pre-revolutionary Russia and their brutal suppression by the military (a thinly veiled allegory for Marx’s communist theory). Montage editing is, put most simply, two dramatically different shots that together produce a third meaning not inherent in either of the shots before. For example, the scene from Strike where a bull being slaughtered is combined with shots of the revoting workers makes a third meaning of ‘the workers are brutally suppressed’. Strike was a success, and Eisenstein later that same year went on to make his silent masterpiece Battleship Potemkin. The avant-garde in this early stage of the Soviet Union is concerned with revolution in an active form; artists were reacting to and endorsing the new communist system. Although it was successful, it was still chaotic – WWI was still taking place; the civil war that erupted after the Bolsheviks took power had brought the country to its knees; the revolution had not yet settled. This is mirrored in the cinema; non-linear editing, dramatic camera tilts, and clashing imagery which can be seen throughout Eisenstein’s filmography, all combine to tell us that although the revolution had happened, work still needed to be done. Stalin’s reign began almost immediately after Lenin’s death in 1924. During the early years of Stalin’s tenure, the Soviet Union underwent a huge process of collectivisation and rapid industrialisation, powering the country forward to become a major player on the world stage. However, food shortages resulted in the great famine of 1932-33, that saw millions of people starve to death. Yet, the Soviet Union, after the turbulent beginnings of the revolution, was now settling into some sort of order; there was no war, and the country had begun it’s economic five-year-plan which lead to creating relative economic stability. After dismissing and exiling high-level opponents like Leon Trotsky and the Great Purge of 1934-39, Stalin had consolidated his power by the 1940s, becoming the de-facto ruler of the USSR. How did this political climate change the aesthetic of films in the Soviet Union? One crucial factor was Stalin’s incubation of his cult of personality which he developed to secure his place as the rightful leader in the public eye. In the cinema, we begin to see the advent of films based on the revolution not as unfolding, like under Lenin, but as romanticised history. The camera becomes more stable, the edits less jarring – we visually move from ‘chaos’ into ‘order’ (see the difference between Eisenstein’s films October and Alexander Nevsky for a visual comparison). All pictures under Stalin would have to fall under the dominant artistic style of Socialist Realism. This is a medium that is inherently ‘realistic’ but allows for hyperbole and stylised versions of real life, completely different from the avant-garde that had dominated under Lenin. Stalin’s disdain for the avant-garde would affect the film industry until his death. Yet, this relative peace was not to last; Nazi Germany attacked the U.S.S.R in Operation Barbarossa in 1941, leading to the Soviet intervention in the war. This invasion began the popular trend of the war film on the Soviet screen. A new technology that enabled filmmakers to record synchronous sound had also just come into the grasp of the Soviets, which meant that large-scale musical works based around themes of love, comradeship and victory could be produced. For example, At 6PM After the War follows the tale of two soldiers who meet a woman between battles. One falls in love with her and they agree to meet in Moscow on a bridge ‘at 6PM after the war ends’. There are songs and over-the-top speeches about never-ending love, and the finale shows the two lovers meeting on the bridge against a background of fireworks. Although the film is not visually or narratively exciting, the themes of comradeship and victory are strong; this was the beginning of the trend of the victorious war film. However, the most interesting film of this period is The Unforgettable Year 1919. This film primarily depicts the invasion by the White Army of the city of Petrograd, then the Bolshevik’s stronghold in Russia. As the Red Army feels that they have to surrender, a young Stalin appears and rallies the troops, securing a victory along with the help of a fleet of battleships. This film is considered one of the most important elements of Stalin’s cult of personality It is the only film mentioned by name in Khrushchev’s infamous ‘secret speech’, who denounced it as ‘exaggerating Stalin’s role in the post-revolutionary civil war’. Khrushchev’s tenure is marked by what is known as ‘the thaw’, a series of reforms Khrushchev implemented to reverse the effects of Stalinism on the Soviet Union. It was not a ‘Khrushchev’ way of doing things, but a ‘not Stalin’ way of proceeding. The reforms allowed for greater freedoms in the arts, and saw a revival of avant-garde styles; Picasso, the ‘second most famous communist in the world after Stalin’ was finally allowed an exhibition at St Petersburg’s Hermitage museum. The various nations that made up the U.S.S.R began to produce more and more art that was national to them, rather than the Soviet state. 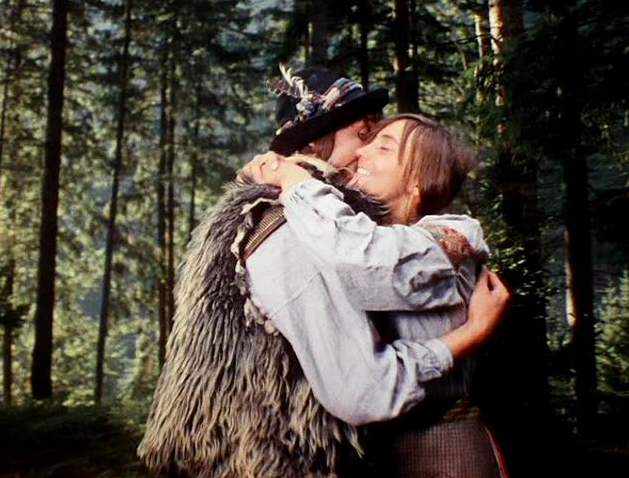 For example, we see the first films not in the Russian language to appear; the stories focus not on war heroes or the glory of the Soviet apparatus, but smaller tales of villages and relationships, such as Shadows of Forgotten Ancestors by Sergei Parajanov and Flower on the Stone by Anatoly Slesarkeno. One of the greatest films of this time is Andrei Tarkovsky’s Ivan’s Childhood, a film whose story of an orphaned boy would be familiar to many in the Khrushchev period. This era is marked by many children growing up fatherless or motherless due to the second world war. This is likely the cause for the rise in the style of cinema we can class as ‘dreamscapes’. These are characterised by long, steady camera shots, perhaps free-roaming or on a dolly track. They are about the absurd, the abstract – from Sergei Parajanov’s beautiful but bizarre The Colour of Pomegranates to Georgiy Daneliya’s Walking the Streets of Moscow. Film in the Soviet Union was moving again back into a period of uncertainty, but unlike in the early avant-garde, this era lacks the fire and hope of the successful revolution. Instead, we see see the beginnings of dissatisfaction with the communist system, started by the Khrushchev thaw; cinematically, there is a search for a deeper meaning (perhaps the meaning of life?) rather than the promotion or endorsement of the communist system. In only forty-seven years, the cinema in the Soviet Union changed dramatically from the flailing, ‘controlled chaos’ of the montage edition of Lenin’s period, to the beginning of dream-like and surrealist imagery under Khrushchev. Each leader’s era has a definite stamp of style on the aesthetic of the cinema in the Soviet Union; it could be down to the desire to further the cause of the revolution, a lack of interest in the medium, or even just personal taste. The aesthetic of the cinema inherently reflects the culture and political mood of each period, and we can learn a lot about how artists interpreted the zeitgeist of their times through these changing visual and aural styles. In the upcoming part of this series on Soviet aesthetics, we will look at the periods from Brezhnev to Gorbachev and how the rise of the Soviet comedy became one of the most popular cinematic styles. Felix Adamson is a filmmaker, photographer and sound designer. After graduating Edinburgh Napier, he decided to specialise in Soviet Film and Theory, as well as contemporary Russian and Eastern European Film and politics at the University of Glasgow, where he gained a Masters degree in Russian, Eastern European and Eurasian studies. He is currently based in Amsterdam, Holland.